A leading Slovak hotel has sent its support to three of its ‘old friends’ in the 2018 FIFA World Cup England squad. Jesse Ellis Lingard, an attacking midfielder for Manchester United and the English national team, learned a trick or two at the AquaCity-Poprad national training centre along with colleagues Marcus Rashford and Danny Welbeck. Jesse, aged 25, from Warrington, attended the Slovak centre and honed his ability to be right where he needs to be … and in Volgograd it paid off as he made mischievous runs-in waiting for a pass. But it was down to England forward Marcus, aged 20, from Wythenshawe, Manchester, to speak confidently after England’s 2-1 win over Tunisia earlier in the week – he predicted they could win again when they face Panama on Sunday. Danny also earned himself a place in the hearts of Slovaks when, as a teenage member of Manchester United’s Academy along with the other two, he used the AquaCity national training centre in Poprad to learn the soccer skills which now have him aiming for the top. 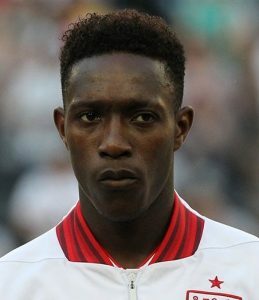 Danny, aged 27, plays for Arsenal and the English national team. He was transferred to Arsenal in September 2014 for a £16 million fee.